Nodes in your currently open Graph Tab. Will add the given string to the start of each Node. Will add the given string to the end of each Node. Will remove x amount of characters from the end of a node name. 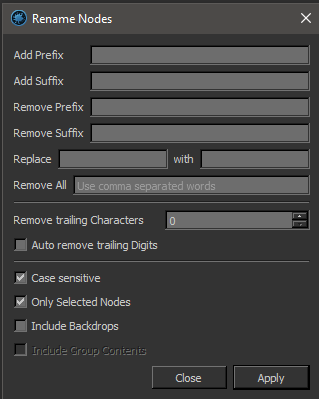 When ticked on all trailing digits and excess whitespaces will be removed from the end of nodes. When ticked all string based operations are run case-sensitive. or if nodes inside of Graph Groups are included. If ticked on, all Nodes in Groups will be included (recursively, groups within groups etc.). Please note that that the search always only progresses down the hierarchy of group nodes. Nodegraph Tab and proceed up in levels, not down.